Join the 2014 McHappy Day Stripes Run! 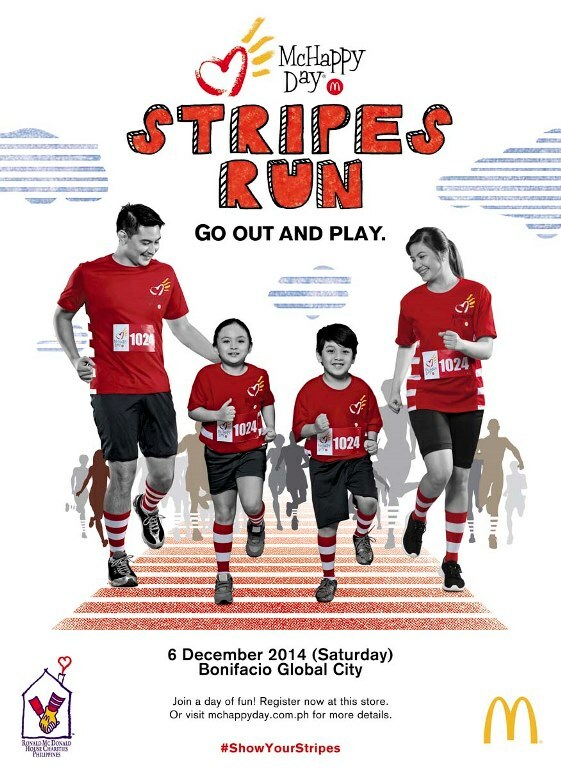 I am happy to share this news from Mcdonald’s: Your family is invited to put on your running shoes and enjoy a one of a kind play date at the 2014 McHappy Day Stripes Run on December 6, 2014 at the Bonifacio Global City! Yes moms and dads, the schedule of the most awaited family run is already set and you are invited to go out and play with your kids on this fun day! • 3K McDonald’s Family Dash, for groups of 4, composed of 2 kids (aged 15 and under) and 2 adults (aged 16 and up). If you’re wondering what’s inclusive in your kit, you’ll be having a race bib, a McHappy Day Stripes Run shirt, a free breakfast meal, a baggage claim stub, and McHappy Day Money to enjoy in the different Family Fair activities. There is also a special addition to this year’s race kits: a pair of Ronald McDonald striped socks. Runners are encouraged to wear the socks on December 6 in support of this year’s beneficiary, the Ronald McDonald Bahay Bulilit, a flagship program of Ronald McDonald House Charities Philippines (RMHC), which builds day care centers for kids in low-income areas. Hurry, registration ends on November 30! Visit www.mchappyday.com.ph for more information. Go out and play with the family at the 2014 McHappy Day Stripes Run!